It was ten-thirty in the morning when I arrived back at the 1946 Curtiss Wright I’d stalked the previous day. This time it was at the invitation of her owners, Robbie and Georgie, after they found the note I’d sticky-taped to their trailer door. Of course the twins, who never sleep, decided to do a double cycle. Worried I would miss my chance to take a peek inside before they departed their curbside camp, I sprinted eight blocks, pram in tow. I found a shady tree next to the trailer, parked the pram and crossed my fingers my boys would sleep long enough for me to have a chat. And thank goodness they slept. Robbie and Georgie turned out to be kindred spirits. According to Robbie, buying Abeona – this incredible 1946 Curtiss Wright – was a serendipitous moment. 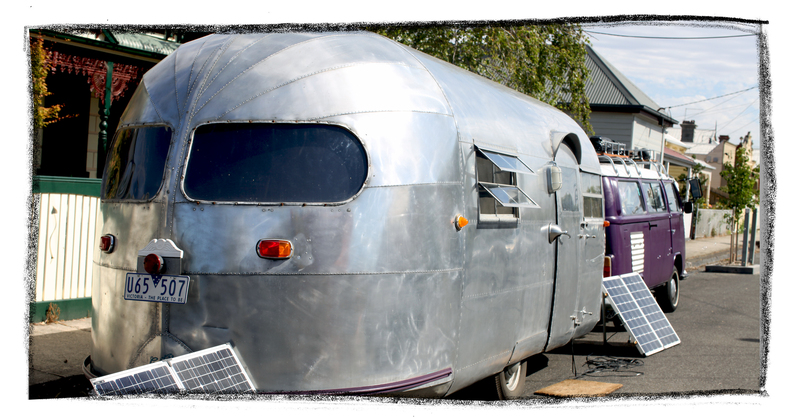 Named after the Goddess of journeys, the 22-foot aluminum trailer is now home to their mobile production studio, Silver Pod Productions. Not a lot is known about Abeona’s life before she arrived in Australia, but what is known of her history is tragic. And true nomads they are. 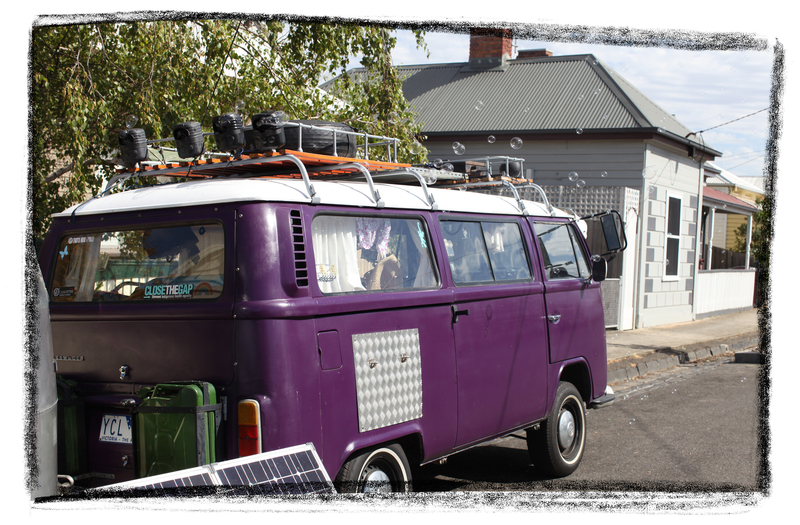 Based in a country town in Victoria, the couple have travelled all over Australia with Abeona, pulled by a faithful purple Kombi named Aurora. Setting up their production company has been a long road, but Robbie says they have now found the perfect balance between bread and butter work and the more altruistic documentaries that inspired them to start filming together in the first place. Their first major project was to film a Ni-Vanuatu male circumcision ceremony, at the instigation of a Professor from Melbourne University. And Abeona and Aurora have been well-received everywhere they go. And with that, Robbie turned on the row of bubble machines wired to Aurora’s roof. Fantastic story and pics…what beauties- and to think of all the history. Love your blog!! What a wonderful story!! Thier set-up is classic! Thank you so much for sharing!! Brilliant article! Wishing Georgie and Robbie (and the soon to arrive little ‘un) the very best! 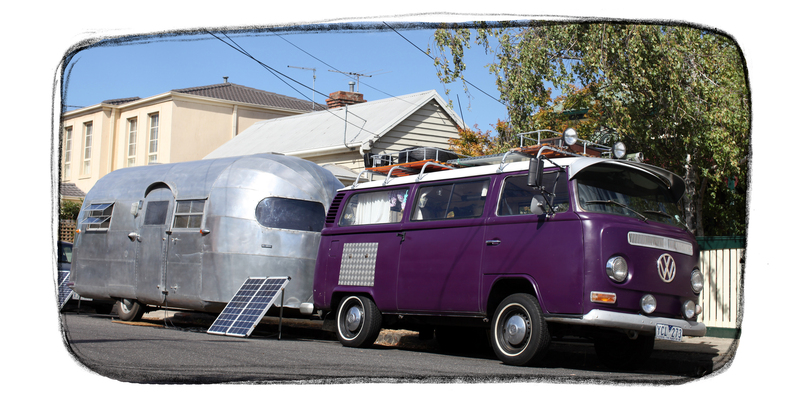 I’m lucky enough to have been in the Airstream and it’s a very special space, and they are very special people.